Kedarkantha is a trekker’s paradise in Western Garhwali in the Uttarakashi district and height of 3810 meters which is about 12,500 feet which covers a distance of 20 km. It is medium level and ideal trekking place. Kedarkantha trek is one in my bucket list. Winter season is the perfect time to go for this trip. Mountains cover with full of snow and we even get snow fall during the trek in winter season. It is perfect place for those who love snow and adventure. Kedarkantha trekking is always a pleasure due to its magnificent beauty and natural views that cannot be compare with any other destinations within the country. Truly nature at its best. Beautiful landscape with lovely lakes, tranquil rivers, mountains and rising Himalayan peaks makes trekking journey more adventurous and challenging. It is superb place for those who love skiing, photography. Skiing is not easy sport but constant practice makes it easy. Rivers water is crystal clear and beautifully as the forests on their shores were standing as the protectors. It is also perfect place for photographers to capture the beauty of nature. I think everyone should plan at least a trip to this marvelous site in lifetime. It is perfect mixture of adventure, beauty. While trekking we can experience all above mentioned activities. It is neither very difficult which enables even the beginners to set on the adventure and enjoy the beauty of nature at its best. One should take care himself from snow. Huge and thick layer of snow may cause problems while trekking, so one should be prepare for all hurdles and able to jog before committing for the trekking. Apart from various activities, Local food makes you feel so spicy and hot during chilly winter season. 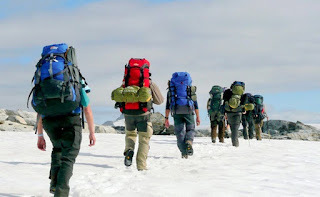 In a whole the trekking tour gives us refreshing and heart filled pleasure which makes the destination so attractive to millions of visitors throughout the year. Tents of good quality, blankets, extra bed sheets, jackets, head masks and sweaters along with other regular trekking shoes, poles, heaters etc..